Ending health insurance discrimination against licensed providers of healthcare services is one of the most important objectives of IHPC’s policy work. IHPC principals were part of the collaborative team of specialists who supported the work of former U.S. Senator Tom Harkin of Iowa, who lead the creation of the non-discrimination provisions of the Affordable Care Act that are set out in Section 2706. 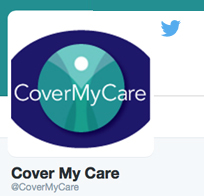 Building off of this federal statute, the CoverMyCare network of state-based advocates, practitioners, patients and policy experts continues to advocate and work for consumer access to all safe and effective licensed services. 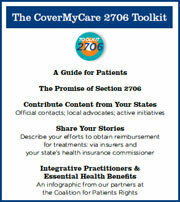 Ideas and guidance for understanding the promise of Section 2706…talking with your practitioner and your MD about access to all the care options important to you…crowdsourcing tools to Share Your Story and Contribute Your State Information…and connect with others in your state: it is where the action is when it comes to encouraging your state’s health insurance commissioner to direct insurers to comply with Section 2706. IHPC is extremely grateful to the founding sponsors of CoverMyCare: Bastyr University, the American Massage Therapy Association (AMTA) and the Academy of Integrative Health and Medicine (AIHM) for their critical support.